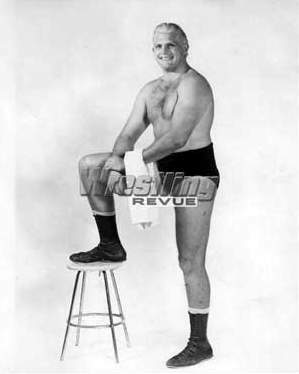 Early 1960s: Bob Merrill worked briefly under a mask as one half of the Mighty Yankees tag team with Moose Evans..
~~~Bob Merrill (as Giant Evans) and Moose Evans continued their partnership without masks after dropping the Yankees gimmick..
Bob Stanlee was the “fictional” brother of two legitimate brothers Steve Stanlee and Gene Stanlee..
1982: Mighty Joe Thunder was brought into the WWF, but ended up being so bad he was fired after a handful of tv tapings..
Bob Leonard wrote (August 2011): I can add a little info for you: he also worked as Rip Miller, “brother” of Dr. Bill, Ed and Dan, in Stampede in 1959-60-61. Just parts of each year, I think, and not full time. I also have a note that he worked as Rip Carlson, though I don’t know where. I’m guessing this was very early in his career, and as I recall him he was very, very green when he was up here.